This week's recipes are the simplest so far! 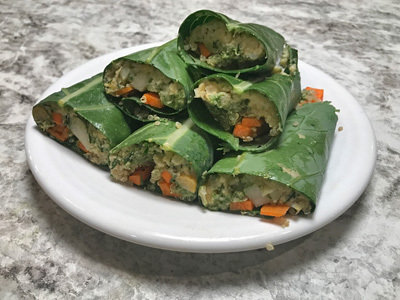 They require the least amount of cooking and uses many of the vegetables in their raw state, which preserves their flavor and nutritional quality. 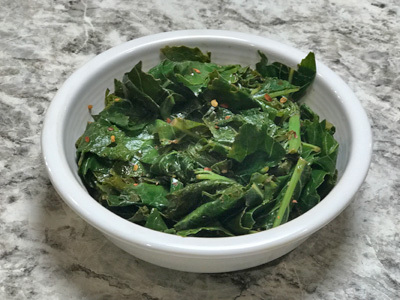 The Garlicky Braised Greens with Balsamic Vinegar recipe below is a perfect way to use the delicious green tops of the double-whammy produce items- turnips and kohlrabi. *For this recipe goat cheese can be substituted with a 50:50 mixture of plain cream cheese and feta cheese. Prepare goat cheese spread by mixing 1 tsp of finely chopped dill with 1/4 cup of goat cheese. 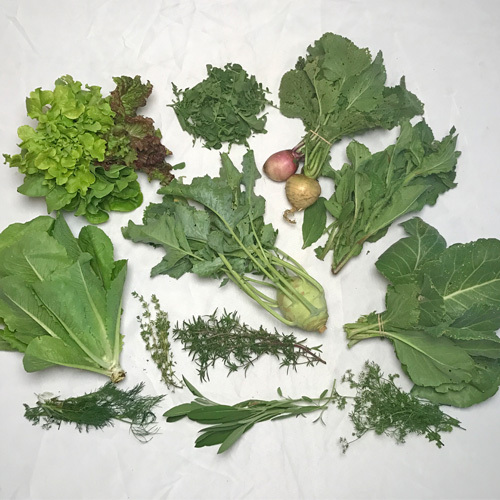 Rinse borage greens in cold water. Bring a pot of water to a boil. Once boiling blanch the borage greens in the water for 60 seconds then immediately submerge in an ice bath to arrest cooking. To assemble grilled cheese- Bring a skillet up to medium heat. Spread a thin layer of mayonnaise on the outside of both slices of bread. On the first slice to enter the pan add a thin (or thick) layer of borage greens, then cover skillet and cook until bread is golden brown. 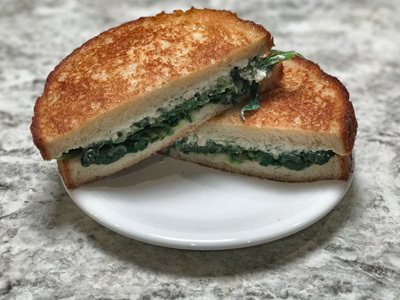 On the second slice spread a thin layer of the goat cheese (or cream cheese with feta) with dill on one side of the bread and a thin layer of mayonnaise on the other. Add second slice, then flip sandwich and cook covered until underside is golden brown. Remove from pan and serve. To prepare cress pesto- add 1 bunch of rinsed upland cress, about 1.5 cups, to food processor. Add 2 cloves of garlic, 1 tsp of salt, 1/4 cup of pine nuts or walnuts, 1/4 cup of grated parmesan cheese, and slowly add 1/2 cup of olive oil. Blend until smooth. To prepare cilantro hummus- Soak 1 cup of chickpeas overnight, then drain and rinse before cooking. Or, if not soaked, bring chickpeas up to boiling in a pot of water covered by several inches and allow to boil for 5 minutes. Remove from heat, add cover, and leave for 1 hour. Rinse beans again, then add fresh water and bring to a boil and allow to cook for 60-90 minutes, or until easily pierced. Once tender drain beans in colander. To prepare hummus in a food processor or blender, first add 1 bunch of cilantro leaves and blossoms, about 1/2 cup, 6 cloves of garlic, the juice of 1-2 lemons or 2-3 tbsp of lemon juice, 2 tbsp of olive oil, 6 tbsp of tahini sauce (or if you can't obtain tahini, you can add more olive oil, skip it, or add another nutty paste like peanut butter or almond butter) and 1 tsp of salt. Blend ingredients into a paste, then add chickpeas and blend until smooth. If the paste gets too thick to blend, add more lemon juice, olive oil, or a bit of water. Cook 1 cup of quinoa in boiling water for 15 minutes or until tender. Julienne 1 kohlrabi bulb (1/2 can be used in salad below) and 2-4 carrots. To assemble collards wrap first remove leaf stem and flatten greens. Add ingredients along the length of the leaf mid-rib to ease wrap folding. First add a thick layer of cilantro hummus, followed by a thin layer of cress pesto, then several matchsticks of kohlrabi and carrots, and then a nice heaping of quinoa or another grain (adjust ingredient ratios to your preference). Fold the leaf edges inward and enjoy. 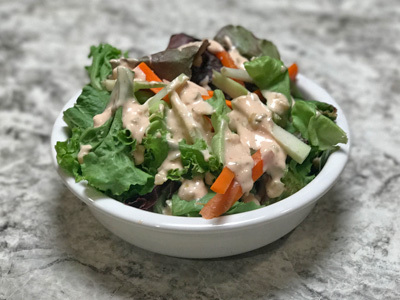 To prepare homemade Thousand Islands Dressing combine 1/2 mayonnaise with 2 tbsp of ketchup, 2 tbsp of sweet pickle relish, 2 tsp of finely diced onion, 1/2 clove or 1/2 tsp of garlic, 1 tsp of white vinegar, 1/2 tsp of salt, and 2-3 dashed of tabasco sauce. Rough chop several cups of romaine and each of the oakleaf lettuces (red and green). Add a handful of julienned kohlrabi and carrots. Dress salad with homemade Thousand Islands dressing. Bring a skillet to medium heat and add 1 tbsp of olive oil. Cook 1-2 cloves of garlic for several minutes, then add 2-3 cups (or more) of rough chopped greens including turnip tops, kohlrabi leaves, and collard greens. Add 1 cup of water, a pinch of red pepper flakes, and 1/2 tsp of salt and cook greens covered for 10-15 minutes. Remove from heat, stir in 2 tsp of Balsamic vinegar, and serve. To make turnip and potato mash- Remove turnip tops (save for Garlicky Briased Greens recipe) and peel roots. Chop into 1/2 inch cubes. Chop 1 or 2 potatoes into 1/2 inch cubes. Add turnips and potatoes to pot, cover with water, and bring to a boil. Boil for about 15 minutes or until roots are easily pierced. Drain turnips and potatoes and then mash until smooth. Add 1-2 tbsp of butter, 2 tbsp of goat cheese (or cream cheese), and up to 1/4 cup of sour cream. Add 1 tsp of salt, 1/2 tsp of pepper, and 1-3 tsp total of finely chopped summer savory, thyme, and sage. Stir until well combined. 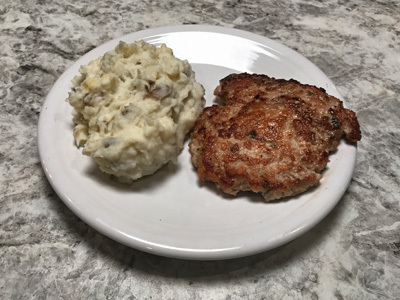 To prepare savory chicken pattie- Mix 1 lb of ground chicken (or pork) with 2 tsp each of finely chopped summer savory, sage, and thyme. Add 1 tsp of salt, 1/2 tsp of pepper, and 1/2 tsp of red pepper flakes. Divide mixture into 4 patties of equal size. Bring skillet to medium heat and add 2 tbsp of oil. Cook pattie, covered, for 5 minutes on each side, or until well browned. Remove from skillet and plate with turnip and potato mash.